Alabama’s victory not only impressed fans and the media, but it also impressed recruits as well. Because of a new SEC rule, the Tide’s coaching staff was able to invite some recruits to Saturday’s game against Michigan and to say they were impressed, is an understatement. 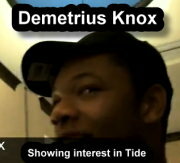 Texas recruits Demetrius Knox and defensive back Nick Watkins, both rated 4-star prospects, both were star struck with the Tide. To read what other recruits had to say, check out this story on AL.com.